^ Edge 2004, p. 185. ^ Helen Ting. The Politics of National Identity in West Malaysia: Continued Mutation or Critical Transition? [The Politics of Ambiguity] (PDF). Southeast Asian Studies, 京都大学. J-Stage: 3/21  and 5/21 . UMNO came into being in 1946 under the impetus of the Anti-马来亚联邦 Movement based on this ideological understanding of ketuanan Melayu. Its founding president, Dato’ 翁惹化, once said that the UMNO movement did not adhere to any ideology other than Melayuisme, defined by scholar Ariffin Omar（英语：Ariffin Omar） as “the belief that the interests of the bangsa Melayu must be upheld over all else”. 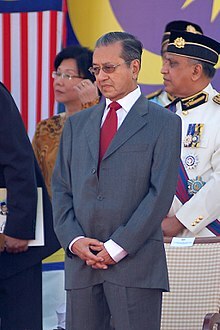 Malay political dominance is a fundamental reality of Malaysian politics, notwithstanding the fact that the governing coalition since independence, the 联盟 (马来西亚) [subsequently expanded to form the Barisan Nasional or literally, the “National Front”], is multiethnic in its composition. ^ Jinna Tay; Graeme Turner. Television Histories in Asia: Issues and Contexts. Routledge. 24 July 2015: 127–. ISBN 978-1-135-00807-9. ^ Jan Senkyr. Political Awakening in Malaysia. KAS International Reports. 2013, (7): 73–74. ^ UMNO Online. UMNO's Constitution: Goal 3.5. From: Archived copy. [5 January 2013]. （原始内容存档于29 February 2012）. ^ UMNO Online. UMNO's Constitution: Goal 3.3. From: Archived copy. [5 January 2013]. （原始内容存档于29 February 2012）. ^ Malaysia : History | The Commonwealth. ^ Adam, Ramlah binti, Samuri, Abdul Hakim bin & Fadzil, Muslimin bin (2004). Sejarah Tingkatan 3, pp. 60–65, 75. Dewan Bahasa dan Pustaka. ISBN 983-62-8285-8. ^ Keat Gin Ooi (编). Southeast Asia: A Historical Encyclopedia, from Angkor Wat to East Timor, Volume 1. ABC-CLIO. 2004: 138. ISBN 9781576077702. ^ Adam, Samuri & Fadzil, pp. 137–140. ^ "About MIC: History" 互联网档案馆的存檔，存档日期2006-02-20.. Retrieved 28 January 2006. ^ Adam, Samuri & Fadzil, p. 140. ^ Adam, Samuri & Fadzil, p. 103–107. ^ Adam, Samuri & Fadzil, pp. 148, 151. ^ Adam, Samuri & Fadzil, p. 153–155. ^ Ooi, Jeff (2005). "Social Contract: 'Utusan got the context wrong'" 互联网档案馆的存檔，存档日期30 October 2005.. Retrieved 11 November 2005. ^ Goh, Cheng Teik (1994). Malaysia: Beyond Communal Politics, p. 18. Pelanduk Publications. ISBN 967-978-475-4. ^ Shuid, Mahdi & Yunus, Mohd. Fauzi (2001). Malaysian Studies, p. 29. Longman. ISBN 983-74-2024-3. ^ Adam, Samuri & Fadzil, pp. 214, 217, 220, 222, 223. ^ Rahman, Tunku Abdul (1965). "A dream shattered" 互联网档案馆的存檔，存档日期2006-02-08.. Retrieved 5 February 2006. ^ Ooi, Jeff (2005). "Perils of the sitting duck" 互联网档案馆的存檔，存档日期28 December 2005.. Retrieved 11 November 2005. ^ Means, p. 6, 7. ^ Means, pp. 11, 12. ^ Means, pp. 20, 21. ^ Means, pp. 22, 23. ^ Means, pp. 29, 30. ^ Means, pp. 36, 37. ^ Means, pp. 39, 40. ^ Means, pp. 41, 42. ^ 44.0 44.1 Means, p. 202. ^ 46.0 46.1 Means, p. 206. ^ 48.0 48.1 Means, pp. 218, 219. ^ Means, pp. 224, 225. ^ Terus fokus menyatukan Melayu. Utusan Online. 1 December 2012. ^ Malaysia's GE13: What happened, what now? (part 1). ^ Singh, Daljit; Smith, Anthony. Southeast Asian Affairs 2002.